Analysis of the elongation cycle may conveniently begin at the point when the peptidyl-tRNA occupies the P site of the translating ribosome while the A site with the codon of the template polynucleotide positioned there is vacant (Fig. 9.1 (top)). Such a ribosome is capable of binding the next aminoacyl-tRNA molecule. Although the binding of the aminoacyl-tRNA to the ribosomal A site appears to involve several binding centers of the site and, correspondingly, several regions of the tRNA molecule, the specificity of the bound aminoacyl-tRNA depends exclusively on the template codon. In other words it is the codon that is responsible for selecting the corresponding aminoacyl-tRNA (cognate aminoacyl-tRNA), i.e. the tRNA carrying the aminoacyl residue coded by a given codon. According to Crick's adaptor hypothesis (see Section 3.1), the structure of the amino acid residue is irrelevant as far as the selection of aminoacyl-tRNA by the codon is concerned. The codon is capable of complementary interaction only with the tRNA residue that plays the part of adaptor. Therefore, the amino acid residue attached to such an adaptor becomes presented to the ribosome without participating in codon recognition. When the Ala-tRNACys was added to a cell-free system containing ribosomes programmed by statistical poly(U,G) copolymer coding for phenylalanine, leucine, valine, glycine, tryptophan, and cysteine, but not coding for alanine, the synthesis of an alanine-containing polypeptide was observed. In another experiment, where the Ala-tRNACys was added to the reticulocyte cell-free system of globin synthesis programmed with endogenous mRNA, alanine residues were incorporated into the synthesized polypeptide chain at positions normally occuped by cysteine residues. Codon recognition proceeds by the pairing of the codon with a complementary nucleotide triplet present in the adaptor. Hence, selecting aminoacyl-tRNA should be governed by a complementarity between the codon and this triplet, which is termed the anticodon. 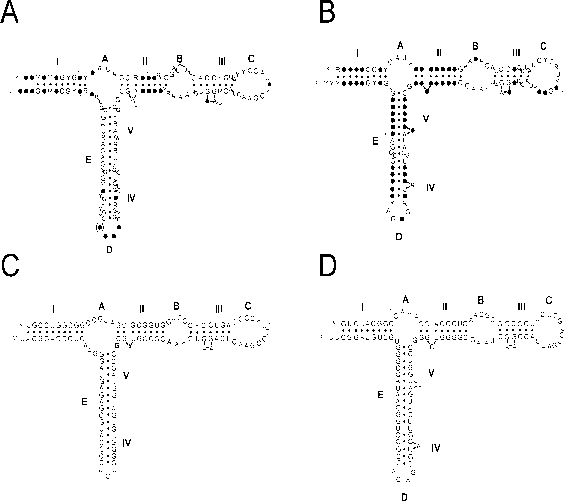 Experimental proof of the decisive part played by codon-anticodon complementarity in binding aminoacyl-tRNA has been provided by studies of mutationally altered tRNA with nucleotide changes in positions 34-36 (Fig. 3.8) corresponding to the anticodon. For instance, when the GUA anticodon of tRNATyr of Escherichia coli is changed into CUA, the Tyr-tRNATyr| no longer recognizes the tyrosine UAC codon but does recognize the termination codon UAG (Goodman et al., 1968).